Continuity! 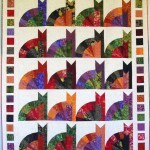 A favorite pattern and kit at the Blue Hen Quilt Shop. Because let us not forget I do own the Blue Hen Quilt Shop in Newark Delaware and must keep it creating too! 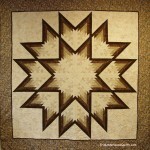 This quilt is made with lots of our Australian fabrics – stunning! Hexology – a Block of the Month on-going at the Blue Hen. 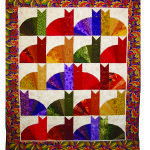 As soon as we are through it, this pattern will be available for purchase too. 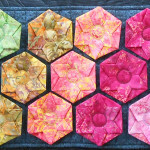 We are making hexies with 60-degree triangles – nine different techniques! Lots of fun! Modern Star. 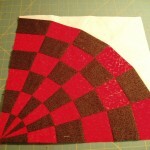 This uses my Creative Grids 45-degree Diamond ruler. MAQ is offering this as a 2-day workshop at the July, 2018 retreat. Want to come play? My Money Tree. I found this hanging in a Mancuso Show! 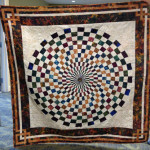 Made it a year or so ago for a challenge with the Mason-Dixon Quilt Professional Network. 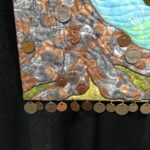 The challenge title was “Let It Grow.” I have to admit it was a little intimidating drilling through the coins but I like the way it turned out! My new 22.5 degree Triangle Ruler from Creative Grids! Look what it can do – still working on more options too! Dahlia Delight! When is a Dahlia not a Dahlia? When it is dresdens! Tumblers – Sassy Tumblers at that! Squffets – Quick and Cute Two! 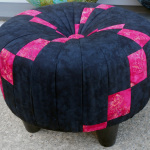 Yep – that’s right… Square tuffets! 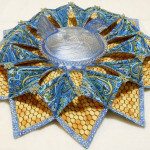 And Tumbler Love – interlocking Tumblers for your table! 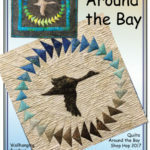 In addition to all this, the Blue Hen Quilt Shop ran a very successful Quilts Around the Bay Shop Hop in March where we proudly displayed the Chesapeake Bay Blues Quilt designed from blocks from all the participating shops in the Hop. Our block was the Geese Around The Bay. 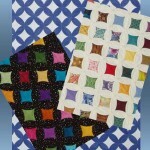 Both the single block as a wall hanging pattern and/or kitted or the entire quilt kit complete with patterns are available through the Blue Hen Quilt Shop. 302-533-5215. If you are in the area, it is definitely worth a trip into the shop to see this beauty! 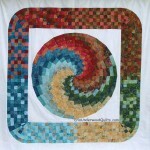 Ok – off to make a few more quilts! 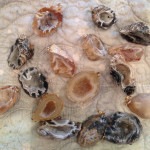 Fun Stuff – Look at all the tuffets! 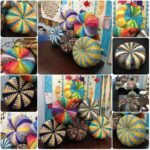 Look at all the great tuffets we made in the most recent Quick and Cute Tuffet class at the Blue Hen Quilt Shop in Newark, Delaware! 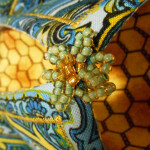 There’s one made from Australian fabrics and a stunning one with the dresden flower in the center! One student even made a tuffet from her all of her husband’s chef pants! All done in a day! Next workshop is in September – perhaps you’d like to join us! 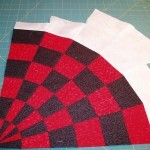 The pattern is easy – if you can’t be in Newark, you can certainly do it yourself at home. 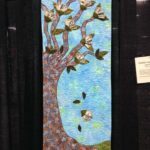 They say imitation is the best form of flattery and I am the first one to tell you that there is nothing new in the quilting world. Somebody somewhere has already done that. But I do have to say, do your research and then decide if you will be stepping on toes or even more than toes as you move forward in your pursuit of creating and sharing your wonderful ideas. Give credit where credit is due and avoid at all cost claiming your inspired (or downright copied) project as your own if it is not. I say this in light of several occasions in recent months when I have discovered that there are a few designers and/or teachers who apparently really like what I do and want to make my ideas their own. And I can appreciate that. 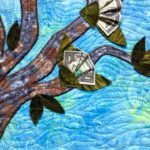 After all, it is my goal to inspire you, to push you to be more creative, to step out of your quilting box and try something new. And I want to make it easier for you to do that. Hence, I write my ideas down in the form of patterns and have them distributed all over the world. Now many of you have seen my Quick and Cute Tuffets. 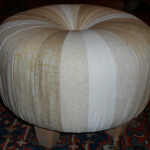 Tuffets are not new. They have been around for several hundred years and every now and then, they regain popularity, sort of like bell-bottoms. 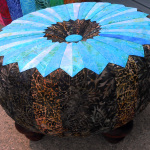 My design offers lots of variations and unique construction techniques that are not like any other tuffet pattern out there. 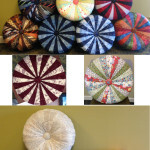 Imagine my surprise when another nationally distributed designer decided to re-write my tuffet pattern as her own. Unfortunately, she is not a good at the illustrations as I am and took it upon herself to xerox one of my illustrations straight out of my Quick and Cute Tuffet pattern and put it in hers. I know… right… After I found out about it, I consulted a lawyer and sent her a letter to get her to delete my unauthorized contribution to her pattern. I even ordered the pattern a third time to see if she complied. I still had to send an email to get her to stop. Not once did I get an apology, or even an acknowledgment that she shouldn’t have done that. 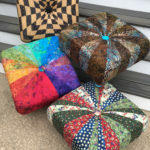 And then there are the teachers out there who buy the Quick and Cute Tuffet pattern, make their sample and then teach others without requiring the students to purchase the pattern. 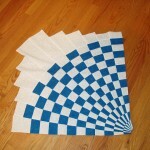 I am so happy you like my pattern and it works so well for you! But please remember, this pattern was not designed as a teacher’s handbook but as a pattern for all to follow. 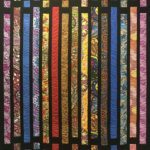 It is downright uncomfortable when I have to insist you follow the “rules” of teaching in the quilting world – which is what I have had to do a few times in the last couple of months just to protect my designs. But the most heartbreaking incident of design “thievery” goes out to a former friend of mine. 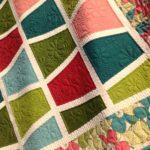 She was most recently published in a national quilting magazine telling the world that she came up with this idea of how to create fan blocks with no curved piecing and no applique. These are just a few of my patterns that support my technique of adding backgrounds onto fan blades and them squaring up the block to the size it is supposed to be. I am sure that this is not a new technique by any means. Great minds think a like and any one at any time could also come up with this idea. I did back in 2008 when I wrote the pattern for Phatkats. At the time, Phatkats was made with templates with all the brainstorming going on in the back of my head for a ruler to support it. 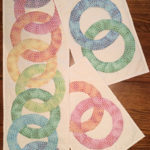 I showed this technique to that former friend of mine who was teaching at the same quilt shop I was. She asked if she could use the technique in her classes and of course, I agreed. After all, it is a technique that was meant to be shared. We even discussed my timeline for getting that ruler made. Two years later, I had to ask this former friend to stop making the ruler that I told her I was going to do. She seemed genuinely contrite and said that she thought I “given” her the technique and ruler idea… Okay, maybe I like to believe that everyone is good deep down. And she seemed so genuine… so we remained friends… or so I thought… Needless to say, I got right on the ball of getting that ruler made because if a “friend” would try to take it from me, no telling who else would, right? 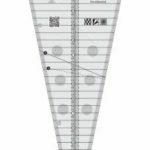 As a result of this little eye-opening experience, the Creative Grids 15-degree Triangle ruler was designed by me and is one of the top selling Creative Grids rulers out there. 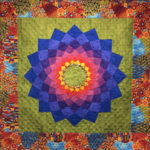 And I continued to socialize with this woman, monthly lunch meetings, a trip to the Houston Quilt Show as well as other quilt shows, even held a private class in my house for her and others to teach them one of my patterns using this technique. Apparently my eyes weren’t open wide enough though. Imagine my surprise and incredible disappointment to see that article in that national quilting magazine. And to read the sentence that quoted her saying “I figured out how to cut and sew an arc using straight lines and a 15-degree ruler”. Well, yes, she sure did figure it out after I showed it to her in 2008 in the quilt shop and again in 2011 in my house. 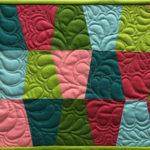 Again I say there is nothing new in the quilting world and someone could have come up with this idea on their own. But if you know me and I showed you how (more than once), be honest about it. At least admit that you learned the technique from someone else. My only consolation in this little diatribe about the shortcomings of some quilters, is that I am older and wiser now and will protect my designs much more stringently than ever before. 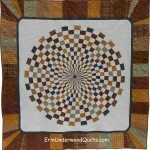 Meanwhile, I will assume that I have “arrived” in the quilting industry since my work is getting such “flattery”. And I will keep designing because I just can’t help myself. 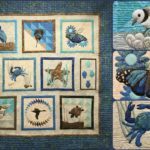 Introducing the Blue Hen Quilt Shop! 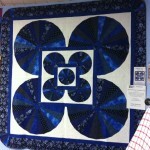 I am proud to announce that my husband and I are the proud owners of the Blue Hen Quilt Shop! 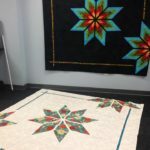 New to Delaware, we are located at 73 Marrows Road in Newark (302-533-5215) and are happy to provide what ever you need to make your quilting life great! We are participating in the Row by Row 2016! Check our our Delaware Delight row – Diamonds for the Diamond State, Blue Hen, the state bird, Peach blossoms, the state flower and of course, the Lady Bug, the state bug! Come in and pick up your free pattern. Kits are available too! It all starts June 21st! Class and more classes are offered at the Blue Hen. 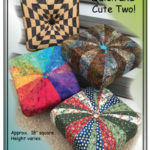 Quilts, Bags, Tuffets and more! Check out our website – it’s all there. And if you see something you like and can’t come in to get it yourself, just a few clicks of your mouse will bring that special something you need right to your door! Hope to see you all at the Blue Hen! So, it happens from time to time – these two patterns were release with an error. Luckily not many have circulated before the error was found. I hope you didn’t get one but if you did, I am sooooo sorry for any trouble it may have caused you. 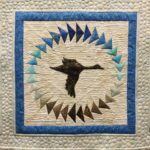 For the last couple of months, my loving husband and I have been setting up our new adventure – The Blue Hen Quilt Shop! Yes, that’s right! 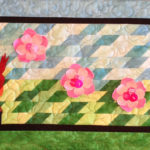 A quilt shop! I have moved out of my formal living room and into a brick and mortar shop located in Newark, Delaware. 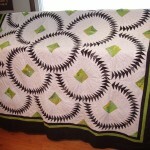 Well, technically, there’s still a lot of stuff in my formal living room that is quilt related but I’m working on it. Here’s a peak at what it looks like. It is a work in progress. Fabric is coming in daily. 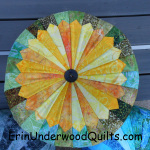 Aurifil Thread is on order. Classes and clubs are being put on the calendar. We hope to have a little something for everyone. 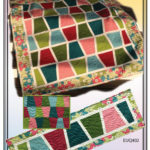 Check out our website www.BlueHenQuiltShop.com and sign up for the newsletter. Or you can follow us on facebook – lots of good pictures there of the entire process. I’ve moved my long arm and sewing machine in and hope to have many wonderful years sharing my love of all things quilty with anyone and everyone. 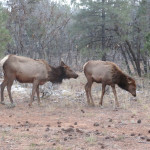 Love to have you come in and look around if you are in the area too! 73 Marrows Road, Newark Delaware! This is such a wonderful pattern! I finally get what all the buzz is about! I finished this easily in an afternoon. 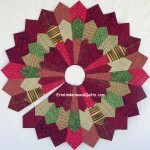 Fold and Stitch Wreath by Poorhouse Quilt Designs. I have to admit I had to read the pattern through a few times only because I couldn’t figure out what the applique fabric was (it’s the yellow, silly me!). When that clicked, all was good! And then there are the beads! My daughter gave me a selection of beads from Ocean Sky Bead Shop (my favorite bead shop!) in Carlsbad, CA for Christmas and they turned out to be just the right color for my flowers! And just enough too! I think I was left with about 15 blue beads after all 12 flowers were finished. This lovely little table decoration will sit proudly in my quilt shop, Blue Hen Quilt Shop, scheduled to open this February in Newark, DE. Our website is up! 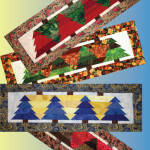 (BlueHenQuiltShop.com) where you can order you very own Fold and Stitch Wreath pattern and much more! 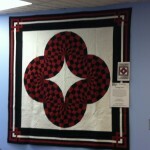 Keep up with all the Blue Hen Quilt Shop happenings on Facebook too. 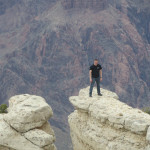 Route 66 and the Grand Canyon! Look what I found on my travels last week! Finally figured out how to use my “pano” option on my phone for this one. Then there was the daring young soldier who climbed out on a ledge! That’s the kind of fearless man we want protecting our freedom! Ran into a few moose who let us get up close and personal! 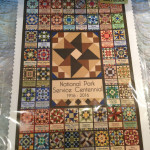 In the gift store was a pre-printed quilt block of all the national parks made by Olde American Antiques. 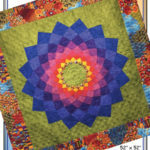 Click on the link to see all they have to offer – free patterns, state blocks, national park blocks… lots of good stuff! And of course, fabric! 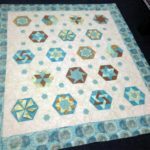 I visited 2 shops – Quilts on Rt. 66 in Williams, Arizona where I found the Rt. 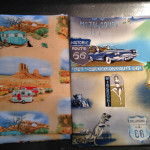 66 fabric (on the right) from Hoffman and Connie’s Quilters Hide-a-way in Kingman, Arizona had the pictorial fabric on the left from Elizabeth’s Studios. This is stuff you will never find on the east coast! It is good to be home now – sleeping in my own bed rather than my son’s futon! 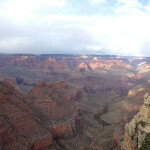 But I can chalk the Grand Canyon off my bucket list! 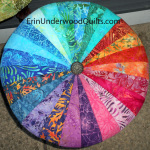 I’ve added more PDF patterns available for download! Yes, now when you see it you can have it! All of these and more can be yours with just a click of the button – Check it out here! I had the good fortune to visit the Lebanon Quilt Guild in Pennsylvania for the third time this year and we made Quick and Cute Tuffets! A couple of these were made from ties and the maker could tell you when and where the ties were worn – those two tuffets are going to be quite the family treasures. If you are using ties for your tuffets, it’s important to open them up and stabilize them for the best results. 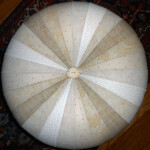 Another tuffet was made with upholstery fabric – who would have thought of that!! Although the fabric was a little thick in the center ( and I am putting it mildly here) it all came together with beautiful results! 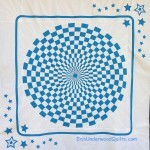 And while I was there, one lady brought in her Optical Illusion quilt from the last workshop I did with the group. 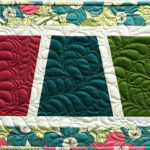 The borders she added were from the Chinese Fans pattern – lovely combination!